The dungeon-crawler finally comes west. Atlus announced Persona Q2: New Cinema Labyrinth for North America and Europe. The 3DS physical version will retail for $40, or you can buy a $70 special edition with extra physical goodies. The Persona Q series is a dungeon-crawler spinoff of Atlus' popular Personal JRPGs. Persona Q2 adds the cast of Persona 5 along with returning favorites and original characters. One of those returning faces is the female protagonist from Persona 3 Portable, who hasn't been seen in some time. 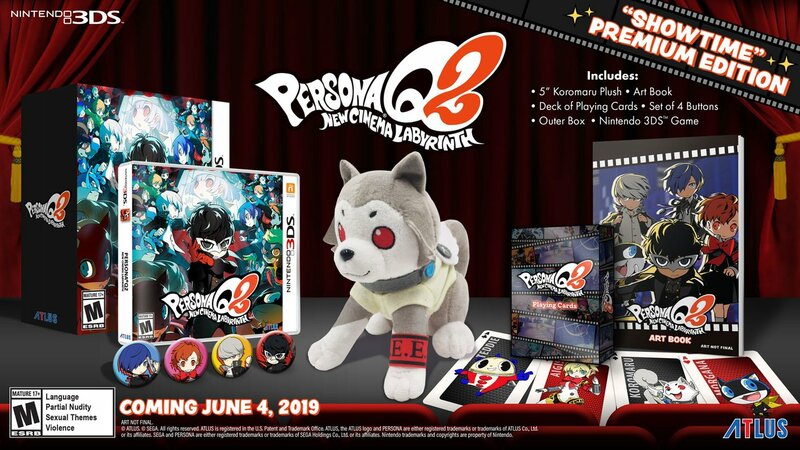 The "Showtime Premium Edition" for $70 includes a Koromaru plush, Persona Q2 art book, Persona-themed playing cards, and a set of buttons. The latter will be included in pre-orders for standard editions of Persona Q2. Atlus previously released Persona 5 Dancing Star Night and Persona 3 Dancing Moon Night, which are rhythm game spinoffs for the PS4 and PS Vita. Persona 5's protagonist Joker is also making an appearance in Super Smash Bros. Ultimate as the first DLC character as part of the Fighter Pass. For more, check out our Persona 5 guide and Persona 5 review for our full coverage of Atlus' latest Shin Megami Tensei JRPG. Tagged with 3DS Handhelds,	Atlus,	News,	Role Playing Games,	Sega.